In a country that declared the end of socialism, a major poll released in January 2016 revealed something unexpected. 43% of people under 30 in the US view socialism favorably compared to only 32% who view capitalism favorably. This shows that despite a concerted effort to smother the ideas of a man who died 133 years ago, the analysis put forward by Karl Marx remains extremely relevant today. Marx is considered the most influential philosopher to ever live. With his co-thinker Friedrich Engels, he developed a way of understanding the world that has not only greatly contributed to the understanding of philosophy and economics but also history, anthropology, political science, biology and many other fields. His work Capital is regarded as the premier dissection of the economic system we live under. His discovery of dialectical materialism redefined the world of philosophy and his rallying call the Communist Manifesto is considered the most influential political document in the world. As the US Empire thrashes to survive the current global capitalist crisis, and with rejection of capitalism clearly growing among young people, I wanted to find out what it was about Marx’s work that has had such a profound impact, from peasants in Asia to miners in Africa, to workers in the US alike, so I talked to someone who has been teaching students and the public about Marxism for years, Dr. Richard Wolff, Professor of Economics Emeritus at the University of Massachusetts, Amherst. ABBY MARTIN: You’re a Marxist economist. Let’s start with the basics. What is Marxism? And what does it mean to have a Marxist lens with which to view the world? RICHARD WOLFF: I think the best way to understand it is that the difference between Marxism and other things is that it wants to go to the root. It is radical in that sense. It wants to see these problems: homelessness, inequality, an economy that bounces around having a recession or depression every 3 to 7 years, a society that concentrates political power in the tiny number. These recurring problems of capitalism, Marxism says, are built into the system, and if you want to solve them you can’t do that within the framework of the system. You have to face the fact that this system itself is the problem, which is why Marxists tend to be people who abide by the idea that we can and we should do better than capitalism. We should reorganize society because that will be a better way to deal with all those problems than dealing with them individually as if you could solve homelessness or solve inequality by a quick fix, by a marginal adjustment. No, the problems are systemic, so you have to understand how capitalism as a system works in order to begin to work your way to a solution. AM: Can you give a brief explanation of dialectical materialism? RW: Marx was a philosopher, so being a rigorous and systematic thinker, he didn’t want to jump into economics, which is what he focused on, without grounding it in philosophy, so he begins as a student of Hagel, the great philosopher. When he begins his academic life—Marx began as a professor—he taught philosophy. His doctoral dissertation was on ancient Greek philosophy. He wasn’t an economist when he began. He ended up thinking he had to study economics because of how philosophy got him there. And to be quick in a way of an answer to your question, he comes out of a school of thought that believed that ideas were the supreme achievement of human beings. Ideas are what you get from the most refined reflection that the human brain can do. If you’re religiously oriented, ideas are what you get from God, from the spiritual realm, and so the world is really shaped by something prior to the world, namely ideas, so the notion is, sometimes called idealism, that the real world is the product of ideas, and if you want to really understand the real world, go to the ideas that make it what it is. Religiously, in the beginning there was nothing. Then there was first God which is a non-material idea and that creates the world. In Genesis, in seven days God, a spirituality, creates the materiality of the world. Marx rejected that. For him the material is just as important as the ideal. If you want to see where the material comes from, it is shaped by ideas. But here comes his radicalism. It runs the other way too. The ideas don’t come from nowhere. They come out of the real world. The ideas we have as people have to do with the real material problems we have as human beings, and how we solve them. Where do we get our food? Where do we get our shelter? How do we get protection as little children from the elements from our parents? All of these real material matters of life and survival are shaping our ideas every bit as much as our ideas shape the reality. Dialectical materialism is the name for a point of view that says if you want to understand the world, you need to look at how ideas shape the material, but the other way too, and the two interact. That’s the way to see the world, and for that reason when it came to explaining the problems of capitalism, he never could and never did suggest it’s all because of the ideas of people about capitalism. It’s the real way human beings make their food, solve their clothing problems, their relationship problems, that shape their ideas as much, and he was going to analyze capitalism through that lens of the interaction of ideas and concrete material reality back and forth. AM: Marxists take a particular view of history called historical materialism. How does the current era of capitalism fit into the long history? I think you’ve mentioned this before—how this is just the latest chapter in a long history of economic development. RW: The basic idea is that every economic system has in it conflicting forces. The language in Marxism is internal contradictions. The system has in it problems it is constantly struggling with because they are built into the system, and for long periods of time it finds solutions, but in the end, historical materialism says, the internal contradictions become unmanageable, and then there’s a kind of explosion. The system dies, and a new one is born, so we had slavery, for example, in various parts of the world. It was born. It evolved. It had its contradictions. For example, there was the contradiction that the only way a slave system can continue is if you replace the slaves that reach old age and die. That became a big problem for many slaves societies, so eventually slavery couldn’t solve its problems and it died, replaced by feudalism in Europe which went through a parallel process, and then it blew up because it couldn’t solve its problems. So historical materialism begins to look at capitalism through the same lens. What are the internal contradictions? How do they bedevil the system? What solutions, for a while, had they found? When and where might we get to a level of internal contradiction that makes the system tremble, makes it vulnerable? And at that point, if revolutionaries can see and understand what’s going on, they can intervene to move to the next system, to get beyond this. Just like rebels overthrew slavery, rebels overthrew feudalism. The expectation of Marx was that capitalism would generate the contradictions, then the tensions, then the failed solutions that would then bring into being the rebels with the ideas of criticism, Marx himself being one of those, who would eventually move to the next system. To illustrate it as concretely as I can, let me give you an example of the kind of contradiction Marx found in capitalism that has been crucial for everybody else. And I pick it because it’s so relevant right now in the United States and around the world. Every capitalist… I think most of the folks watching know this, just from their personal life… every capitalist is always trying to either make more money or survive competitively by saving on his labor costs. One capitalist does it by substituting machines for working people, automating, getting a computer to do what he used to have fifty people do etcetera. Another capitalist does it by trying to get cheaper workers in place of more expensive ones, hiring women, if they are less expensive, to do the job that they used to pay men more for, hiring immigrants rather than native folks, moving to another part of the world where wages are much lower. We all know that. So capitalists are always trying to save on labor costs because they can make a better profit if they do that, but here comes the contradiction. If all capitalists are reducing the number of workers they pay, or reducing the pay they give to their workers, what will result is that the working people have less and less money, and if they have less and less money they can’t buy what the capitalists are producing to sell. The capitalists therefore are destroying themselves, but they have no choice. They have to save on the labor outlay, and then that comes back and bites them in the rear end because there’s no demand. You’ve been so successful becoming rich as a capitalist, but you’ve killed yourself. These kinds of contradictions for Marx are the beginning of the end of a system. It papers it over. For example, when people couldn’t buy in the 1970s, the capitalist system kept going anyway. How did it do that? How did it keep going when the people didn’t have enough money from their wages to buy? The solution was credit. We loaded the world up with house credit: your mortgage, car payment credit (nobody buys a car except by paying on credit), credit cards, which didn’t exist before the 1970s for anything but traveling businessmen, and a small number of them, and then when that was not enough, we loaded up for the first time in American history, an entire generation of students who can’t get a degree without loading up with tens of thousands of dollars of debt. We kept this system going. People could buy stuff even though their wages didn’t pay for it by borrowing, and in 2008 the predictable happened. It turned out your fix only lasts for a while. You really have to ask this, in a way that many of us as Marxists haven’t done for most of our lives: the problems of capitalism now are so severe, so systemic, so global, that we’re beginning to wonder whether this system is going to find a way out. The Marxists are not the only ones wondering whether this system is coming to an end. The people on the other side of the political fence are very worried too. AM: You have billionaires writing op-eds: “The pitchforks are coming for the plutocrats!” because they know what’s coming. Let’s talk about the bubbles. You talk about the housing bubble, and I think this is a really interesting indication. The housing crisis, the crisis of overproduction, the fact that we have more [empty] houses than we do homeless people, but because you have this crisis of overproduction, too much of something was produced and people couldn’t utilize it. Talk about that concept and why this is an inescapable phenomenon under capitalism. RW: Starting in the 1970s, American businesses began to have what I like to call a eureka moment. They realized that in the West, North America, Western Europe and Japan, a hundred, two hundred years of capitalism had built up impressive factories, offices and stores, but they were built up in the places where capitalism was born, Western Europe, North America and Japan. That’s where they had concentrated everything and that’s where they had drawn workers in off the countryside to become urban, industrialized working classes, and along the way the workers, noticing how productive capitalism was since they did the work, demanded for themselves a rising standard of living. So roughly from 1820 to 1970, particularly in the United States, but elsewhere, wages rose. That’s why over that time capitalists were doing so well that they could raise the wages of their workers and still make out like bandits, so it was a system in which people began to get the idea capitalism works. It delivers the goods because it raises wages. You have to not look at what was happening where most people in the world lived—Asia, Africa, Latin America—because for them the situation was horrible, but if you concentrated on where capitalism was born, you could fool yourself into thinking, “Wow, this is a system that works.” And capitalists, of course, and the people who like it, celebrated all of that. Then in the 1970s capitalists had this eureka moment. They said to themselves, “Wait a minute. We are in North America, Western Europe and Japan where the wages are now very high. Workers are now very happy, but why are we here?” In the rest of the world which has been savaged by the growth of capitalism in those privileged areas, wages are very low. So in this eureka moment capitalists said, “What are we doing here in Western Europe, North America and Japan? It’s much more profitable if we produce in China, India and Brazil.” And there begins what we’re still in the middle of: the exodus, the abandonment of the places of origin of capitalism by the capitalists, so there’s a massive move to China, India, Brazil and all those places, producing what? Well, what every capitalist wants, which is to make a bundle, so they build big factories imagining that they can sell all of this stuff like they used to, but they forgot something. If you go from high wages in the United States to low wages in China, the bottom line is that the people earning wages are earning a lot less than they used to. It’s not just that they’re not Americans; they’re Chinese, but they can’t buy back what you’re building. They can’t manage to consume what you have the capacity to produce. Right now China is slowing down. It’s scaring the whole world, but it’s not China that’s slowing down. It’s the inability of China to sell to the world because the wages of the world’s workers have been depressed now for years as we move out of Western Europe, North America and Japan into these lower… and the system totters as it encounters a very old contradiction in its current form for which they have no solution. And right now when it’s happening on a global scale… Europe is having it. North America is having it… Japan. These are the centers of capitalism. They’re in the most trouble right now and they don’t see a way out, and I don’t either, which makes it possible for the first time in my life to begin to see a capitalism that is in fundamental, shaking difficulty, and if I were to explain to someone why you get bizarre politics unlike what we’ve had for a century, I’d say it’s because of this. And here in the United States you see the kind of theatrical buffoonery, but there’s more to it. Why is Trump such a character in the Republican Party? Why is that party literally tearing itself apart? Because it can’t cope. And even the Democratic Party [can’t cope], suddenly confronted with a socialist who isn’t marginalized simply because he gives himself the name “socialist.” In fact, it makes him attractive. What Bernie Sanders is proving is that the interest in socialism has captured millions of Americans. AM: So I think a lot of people are aware of socialism, now especially since you have a self-proclaimed democratic socialist running for president, but they don’t actually understand what it means. I think they’re taking little bits and pieces—free health care, free education… Talk about the means of production and how a socialist economy would actually be structured. RW: They came up with the following idea: that the problem of capitalism is two fundamental things. One, that private individuals own the means of production. They own the land. They own the factories. They own the stores, the machinery, and the people, the owners, are really a very small part of the population, 1%, 2%, 5%, maybe even 10%, although rarely did it get that high. But that means the vast majority of people are never part of the owners, and the basic socialist idea was if you allow a small number of people to control the means of producing all the goods and services we all need to survive, they’re going to use that control to make the system work for them, and they’re not going to worry about the rest of us. In other words, it’s a recipe for a society that produces wealth for the top 5 to 10%, but not for everybody else. It gives power, political and other power, to those at the top, and not to everybody else, so the socialist idea was this is fundamentally unjust, fundamentally undemocratic. 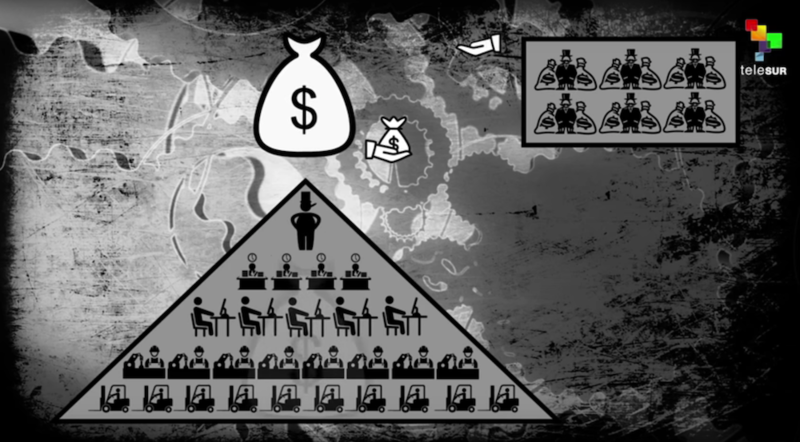 This is what’s wrong with capitalism, and how do you solve it? You make collective ownership, not private. The society as a whole should own the means of production—the factories, the offices, the stores, so that they are good for everybody, so that what they produce is distributed roughly equally, so that the influence on the decisions are made social. It’s why it’s called socialism. It’s the society that should own. It focuses on the workplace. Its idea is that the way you make sure that the government never again becomes an institution over the people, but rather simply an instrument of the people, is by making sure that at the base of society, where people live and work, the wealth, the productive capability, is in their hands. If you want the slogan of 21st century socialism, it’s this: democratize the enterprise. End this process where there is a handful of people who make the decisions. In most American corporations… and corporations do the bulk of the business in modern capitalism… a tiny group of what are called major shareholders, the people who have big blocks of shares, select the board of directors. 1% of Americans own 3/4 of the shares. It’s highly concentrated. A tiny number of people, the 1%, own the bulk of the shares. How do you run a corporation? At the top is something called a board of directors, usually 15 to 20 people. How do you get on the board of directors? There’s an election every year to get on that board, and the way the election works is if you own a share of stock in the company, you get one vote. If you have 10 shares, you get 10 votes. If you own a million shares, you get a million votes. If you have no shares, that’s how many votes you get. There is no pretense of democracy, so if a handful of people own the bulk of the shares, they control everything. They select the 15 or 20 people on the board of directors. The board of directors decides what the company produces, how the company does it, where the company is located, and what’s done with the profits. Everybody helps produce the profits. The employees have to live with the decision, but have no influence on it. It is the opposite of democracy, and if you don’t have democracy at the workplace, you can’t ever have it real in politics, either, because those at the top will buy the political system, something which we see in the United States so starkly every day that everyone knows. If workers took over a factory that had a workers’ co-op instead of a top-down [management], and the workers together decided what to do with the profits, do you think they would give a few executives $25 million so they would have more money than they would know what to do with while everybody else has to borrow money to send their kids to college? It’ll never happen. Do you think a collection of workers, say 400 in a factory, considering that you could make more money if you moved production to China… Are they going to vote to get rid of their own jobs? They’re not going to destroy their community by having an empty factory. They’re not going to deprive their local government of the tax revenues to run the schools and the hospitals and they’re not going to deprive themselves of jobs. So what we’ve had in the last 40 years—all those jobs leaving—they would never have left if it had been the collective decision of the workers where this production is going to take place. RW: The best way to describe this is to go back to Karl Marx and his analysis of capitalism so that we all understand what earning is about. Let’s imagine you are a person looking for a job, and I’m the employer that you’re looking to get hired by, so you come in and you sit down. You fill out your application form and I look at you, and I describe to you the kind of work we’d like to have you do. You come, you do your 9 to 5, Monday to Friday, and you’ll sit over there and you’ll do this kind of work. And we get through all that. You’re OK with that, and then we get to that big question: how much are you going to get paid? And let’s say we go back and forth and we agree on $20 an hour, so I’m going to pay you $20 an hour, and at this point Marx enters with a smile on his face and says, “I’m now going to show you, the reader, that when that deal is done, something is going on that you actually know, but you don’t want to face, but I’m going to show it to you. When I hire you for 20 bucks an hour, I know that for every hour that you give me your work, your brains, your muscles, I’m going to have more stuff to sell at the end of the day because you were added to my work force. You’re going to help me produce more goods or more services, or better quality goods and services than I would have if I didn’t employ you, so I’m going to say to myself, “It costs me to get Abby $20 an hour. What do I get out of it?” I’m going to have the output that Abby adds by her labor. That has got to be more than 20 bucks, so the only way I’m going to hire you for $20 an hour is if you produce more in the hour than I give you. So when you feel in a vague way at the end of the day as you walk home that you’re being ripped off, you’re absolutely right. Or in Marx’s language you’re exploited, so what does the capitalists say? “I earned it.” No you didn’t. You just ripped people off. AM: Famous socialist Rosa Luxemburg once said that it’s either socialism or barbarism. Here we are 100 years later. In what ways have you seen that play out today? RW: One: the 62 richest people in the world, most of whom are Americans… not all of them are, but most of whom are US citizens… the 62 richest people together have more wealth than the bottom half of the population of this planet—roughly 3.5 billion people. That’s beyond obscene. I don’t have an adjective that captures this, but I can describe what it means. If you look at all the statistics of the World Health Organization, the bottom half of our population are people who die way earlier than they need to. Why? Because their diets are no good, or they don’t have enough food in the first place. Or they can’t get to a clinic. They have little problems that are easily solved by modern medical methods. It’s unspeakable what happens to the lower half. If we took half the wealth of the richest, they would still be the richest, and if we made it available to the bottom half, it would transform their lives, literally. Now there is no moral or ethical justification for this situation. Number 2: it is well known all over the world, despite a few deniers that are still around, that the way capitalism has evolved has compromised the ecology and environment of this planet, literally threatening us with 27 diseases and 57 losses of fundamental resources. This is crazy to permit this to go on. This is another way capitalism confronts us with barbarism. And the third one is—and here the United States plays a particular role—is this notion that the Western world, the world that has the wealth and the military might, is in a war, an endless war against something as vague as terrorism, whatever exactly that is. And this is used to justify an endless use of resources not available for people’s needs but to combat one enemy, real or imagined, after another, so we literally confront an endless military warfare state, a cataclysmic destruction of our natural environment, and a level of inequality that has no justification. Our entire economic situation would have been completely different the last 30 years if we had had a movement, if we had had organizations to make these demands because I haven’t the slightest doubt that the majority of Americans will support all of them. It used to be at this point in an interview I would have to look at a skeptical interviewer saying, “Ah, Americans support this kind of socialistic stuff?” I don’t have that problem anymore because Mr. Bernie Sanders has done me a favor. By throwing his hat in the ring in the democratic primary and running around the country, as he’s been doing as a socialist, he has proven for all Americans to see that the support for something other than capitalism has now captured millions of Americans, and we don’t know how many millions because that still has to be shown. And the argument that was heard when Occupy Wall Street emerged in 2011: this is a tiny group of people who don’t represent anything—all that’s gone because Mr. Sanders has said, “Well, let’s see.” Let’s see how many people are critical of the 1% vs 99. How many people will support a candidate who says that every day and even accepts the label “socialist”? And the answer is millions.